This smaller eagle ray looks like its cousins, with its diamond-shaped pectoral disc that is twice as wide as it is long, and its dark gray black top and ivory white underside. But the Atlantic devil ray is smaller, growing to only about 48 inches wide, and its long tail lacks a spine. The devil rays get their name from their cephalic fins, which are normally held tightly curled and look like horns, but are sometimes unfurled and used to funnel food like shrimp towards their wide mouths. The name of the Atlantic devil ray comes from the ray’s distinctive “horns” formed by the forward facing cephalic fins. It is also known as the lesser devil ray (English), devil ray (English), small devilfish (English), atlantische duivelsrog (Dutch), diable géant (French), mante diable (French), diablo (Portuguese), jamanta (Portuguese), manta chica (Spanish), manta enana (Spanish), raya (Spanish), and vestatlantisk djaevlerokke (Danish). The Atlantic devil ray is often confused with its larger family member, Manta birostris, and in many languages the common names appear interchangeable. Rays in general are considered harmless and inoffensive. The Atlantic devil ray has no defensive spine on its tail. However, due to their great size and power (especially in the case of M. mobular or Manta birostris), larger specimens may damage small boats and become dangerous to humans when harpooned or hooked. Due to the uncertainty regarding the Atlantic devil ray’s age, growth and reproductive rates, the species may become threatened in the future if commercial fishing pressures were to increase. 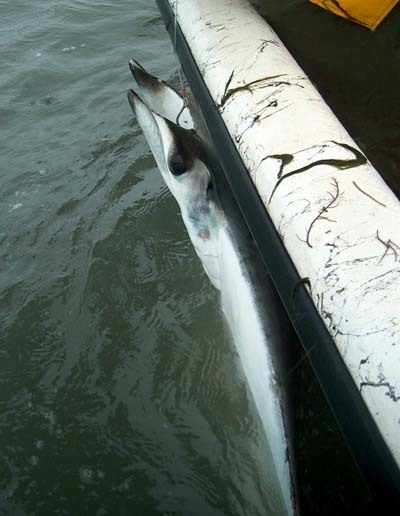 > Check the status of the Atlantic devil ray at the IUCN website. The Atlantic devil ray has forward facing cephalic fins giving it the appearance of having horns, a characteristic so distinct that it could not be confused with anything else except M. mobular. M. hypostoma is identified by its distinctive large body disc covered in small denticles and its long slender whip-like tail lacking a spine, the latter of which distinguishes it from its relative Mobula mobular. The head of the Atlantic devil ray is relatively small and narrow with teeth present in the lower and upper jaws. Atlantic devil rays have been described as black from above. 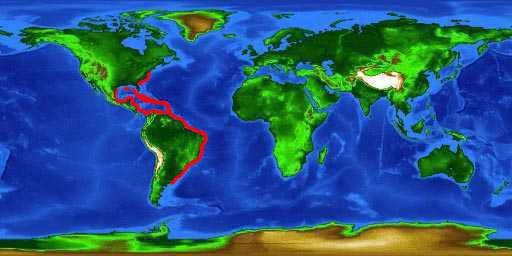 Possible specimens observed off West Africa have been described as blue, however the validity of these specimens’ identifications is in question. The outer cephalic fins, lower parts of the disc and the tail of the Atlantic devil ray are a pale yellowish or grayish white, which continues along the ventral surface. Dentition between the sexes differs with the teeth of the females being diamond, square or rectangular shaped, sometimes with all variations present simultaneously with a range of sizes. Dentition of the male is more crowded with usually one or three (but sometimes up to four or five) long, slender blunt cusps facing inward. Each row of teeth overlaps the next with approximately ten rows of functional teeth in each jaw of both sexes. The disc of the Atlantic devil ray is about twice as wide as long, but this ray usually does not exceed 48 in (122 cm) in disc width. It has been suggested that females may mature at 42.1 in (107 cm) in disc width. Some have been recorded as being born as small as 21.7 in (55 cm) disc width, but most are larger at birth. Accurate information on growth rates, maximum sizes, and size/age of maturity is currently lacking. 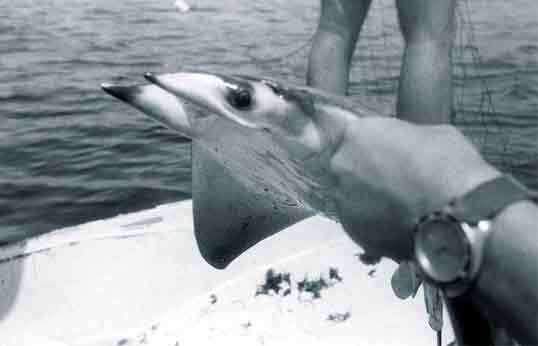 Primarily a pelagic plankton feeder, the few stomach contents that have been examined of the Atlantic devil ray contained remnants of small crustaceans such as shrimp. Evidence of some schooling fish, such as striped salt water minnows found in abundance off the coast of North Carolina, were also found. When feeding, this ray often pushes its way through turtle grass using its cephalic fins to funnel food towards its mouth. When pursuing prey, devil rays have also been seen to rush up to a sandy strip (such as a beach or sandbar) and then swim off. When not feeding, the cephalic fins are tightly curled, giving the “horned” appearance. Little is known about the reproductive biology of the Atlantic devil ray. However, like all rays, the Atlantic devil ray exhibits aplacental viviparity. In one reported observation, a female carried a single embryo, which initially fed on yolk then received additional nourishment from greenish uterine milk that is enriched with mucus, fat or protein. The only reported sighting of copulation states that the pair was in a ventral to ventral position while swimming at the surface with the actual mating lasting approximately 10 minutes. Larger fish and marine mammals are potential predators of the Atlantic devil ray. 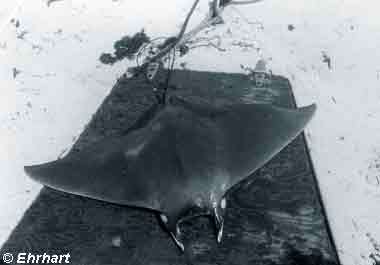 The Atlantic devil ray was described in 1831 by Bancroft as Cephalopterus hypostomus. The scientific name for this ray was later changed to Mobula hypostoma (Bancroft 1831). Synonyms include Mobula olfersii and Cephaloptera olfersii, Müller 1834, Cephaloptera massenoidea, Hill 1862, and Ceratobatis robertsi, Ceratobatic robertsii, and Mobula reobertsi, Boulanger 1897.